I’ve just launched the latest website design and development project for Sujo Remi. It was really great working with such a creative artist duo. Sujo Remi are Brighton based artists working in mixed media and installation art. 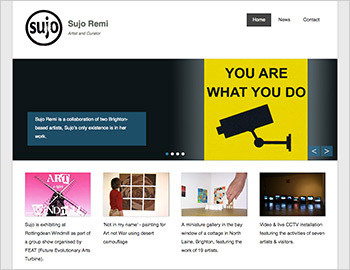 This WordPress build will allow the Sujo Remi website to be expanded on in the future and be a good flexible platform to show case Sujo’s creative talent. Take a look and visit Sujo Remi here and also my website portfolio over at Adur Design for more completed WordPress web design and development projects by me.